In a time before Whole Foods, Rainbow Grocery, Trader Joe’s, and organic produce in supermarkets, one had to shop rather widely in San Francisco to assemble a grocery list of whole foods and organic fruits and vegetables. In the early 1970s, for bulk dry goods there was Oh’s Fine Foods, a narrow storefront on Mission Street with a wooden floor and open burlap bags that felt as if it had been there for a century (and may have for all I know). For organic produce, there was the Alemany Farmer’s Market. For cheeses there were various Italian delicatessens. You might travel to a store only because it carried a particular item, such as peanut butter without hydrogenated fats or cream cheese without additives. In that time of experimentation and alternative institutions, there arose groups that called themselves Food Conspiracies. Perhaps the first was the Free Food Conspiracy, which was formed by a number of communes—that is, communal living groups. They pooled their food stamps, bought food in bulk, and distributed it to members according to need. The Free Food Conspiracy only lasted about a year as participants balked against having to give up “imported cheeses and health food extravagances”1 for the common diet it provided. But others took up the idea and created food conspiracies that used cash to buy just what each household, communal or not, wanted to eat. Conspiracies saved shopping time and provided high quality food, often at lower prices below what was otherwise available. The idea was popular, so conspiracies multiplied. Members rotated through tasks such as collecting orders and money, shopping, and dividing the food. Using this system, one could purchase bulk dry goods, fresh in-season produce, honey, peanut butter, dairy, cheeses, ravioli, chicken, and tofu. My conspiracy was called Ongoing Picnic. My household had the task of going to the Alemany Farmer’s Market at 5:30 a.m. on Saturdays. We loaded up a Volkswagen bug with produce—trunk, back seat, floor, passengers’ laps. As much as possible, we purchased produce that was certified organic. We would drop off the food at the distribution garage, then go home to eat breakfast. When we returned to the garage, other volunteers would have done their work. Orders for each household would be neatly arranged in boxes on the floor around the edge of the garage, with the order lists attached. Ongoing Picnic worked pretty well, though there were occasional glitches. On one memorable Saturday morning, the people who were supposed to divide the food overslept, so when we arrived to pick up our food, it was undivided. The cheese was still in big blocks, the flour and rice in big bags. It wasn’t any fun to divide it when we were all crowded into the space and in a hurry to get on with our days. It seems a minor thing now, but we cited it to each other and to new members thereafter as an object lesson—a parable for the chaos that results when someone neglects civic commitments. We were early adopters of the idea of buying locally, at least in the case of produce, since the vendors at the Alemany Farmer’s Market are nearby farmers, and if they didn’t have it, we didn’t get it. Most of the time, members did very well with the concept, but I remember that one household insisted on ordering apples in late spring and early summer and then complained when apples were repeatedly missing from their box. We’d tell them not to order apples, but they couldn’t seem to learn from experience. Conspiracies had on the order of 10-20 member households. Rather than growing larger, existing conspiracies encouraged formation of new ones. Thus they were small enough that most members knew each other. We sometimes had potlucks or dinners provided by individual households, notably a sushi party led by a Japanese-American member and a chow fun party led by a Chinese-American member. The People's Food System headquarters was in this building at the corner of 20th and Alabama Streets in the mid-1970s. As the number of food conspiracies grew, people saw opportunities to organize wholesale buying operations. Some formed a dry goods warehouse, and one person was supplying dairy and chickens. So when three people who had just arrived in San Francisco from Iowa came up with the idea of opening a food store, some of the suppliers for that store were already in place. In about 1974, they founded Seeds of Life food store at 3021 24th Street. At first it was run by volunteers, including food conspiracy members, who would work for a couple of hours and then shop for items the conspiracy didn’t offer. Soon the store was hiring staff and organizing as a collective. In a collective, decisions were to be made by consensus, with each member having an equal say. 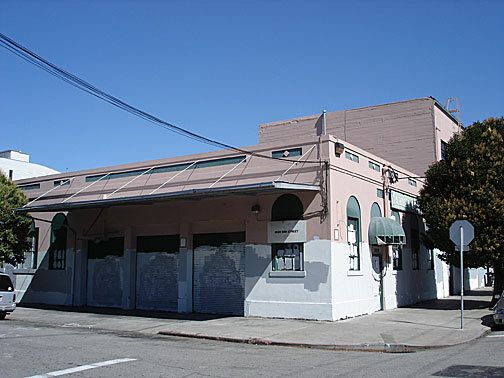 The second store to open was the Noe Valley Community Store and then, in 1975, Rainbow Grocery (founded by members of an ashram) joined the system. 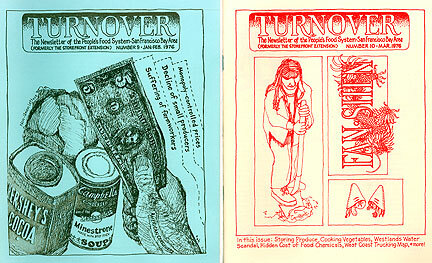 At its peak, the People’s Food System included 11 retail stores, the dry goods warehouse, a dairy distributor, a cheese distributor, two bakeries (one in San Francisco and one in the East Bay), a produce distributor, a refrigerator repair company, a magazine, and, briefly, a day care center. by Pam Peirce, excerpted from her essay "A Personal History of the People's Food System, in the anthology "Ten Years That Shook the City: San Francisco 1968-78" (City Lights Foundation: 2011), edited by Chris Carlsson.